In late 2004 the local Department of Economic Opportunity (DEO) and CareerSource Okaloosa Walton Veterans Staff, introduced a program designed to unite the various organizations that provide assistance to Veterans in our two-county area. The intent of the program was twofold: One, to endeavor to keep Veterans from falling though the bureaucratic web; and secondly to ensure that all VSOs were fully aware of other local and regional resources available for Veterans. Quarterly gatherings of local VSOs known as the VSO Networking Meeting were initiated with a preliminary focus on community-based Veterans Groups such as the VFW, American Legion, AMVETS and DAV. 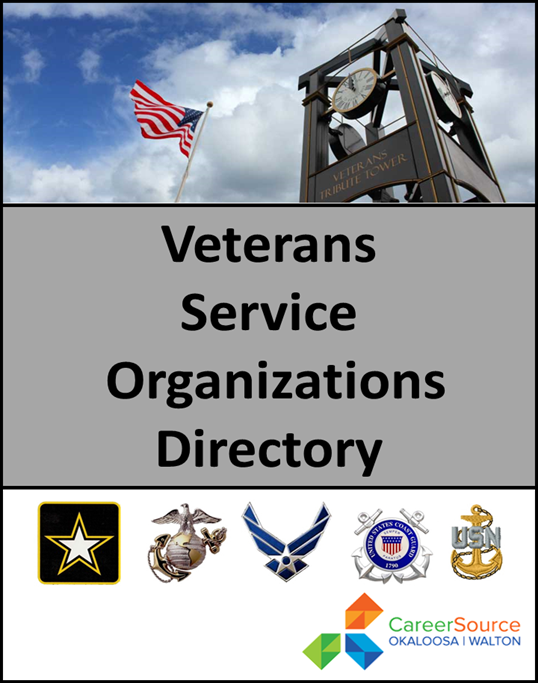 Over time this initial grouping has grown to include local and regional Federal, State and County officials including Educational Institutions, the Florida Department of Veterans Affairs (FLDVA) and multiple representatives from the Department of Veteran Affairs to include the Pensacola and Okaloosa County Vet Centers, local military base VA personnel and the VA Homeless Veteran Outreach Coordinator. Also included in our group are the Directors and their representatives of our two local Airman & Family Readiness Centers located at Eglin Air Force Base and Hulburt Field as well as their naval equivalent from Whiting Field. Attendees have come from an area that stretches from Biloxi to Lake City. More recently staffers from our local Congressman’s office as well as staff from our local state representative’s office have joined our networking group bringing even more effectiveness to the information sharing opportunity this program provides. In May of 2007, to recognize those in the community that go above-and-beyond providing services to our veterans we created a Florida CareerSource Okaloosa Walton Region 02 Veteran Services Hall-of-Fame into which true American Heroes have been inducted in recognition of their long years of service to our Nation’s Veterans. Their names are added to a perpetual plaque that is displayed in our meeting room. To date, twelve patriots have been inducted into the Hall of Fame. Additional members will be nominated and continue to be selected by sitting members of the VSO Networking Group. The mission of VSO remains the same—building the best network possible for serving Veterans and their families.